What kind of school is MLS? Murmur Land Studios is an experimental program of thematic field schools that attempt to connect land-based arts and creative inquiry with philosophical dialogue, temporary camping-based community, and the emergent unknowns of the event. MLS is a temporary school that performs itself coming into existence, before fading again a short time thereafter. Participants are free to apply for one, several, or all of the residency offerings in the 2017-18 programme. PLEASE NOTE: OUR DEADLINE FOR 2018 FIELD SCHOOL APPLICATIONS HAS BEEN EXTENDED UNTIL JANUARY 31, 2018. What does a typical day look like during an MLS residency? Days are anything but typical at MLS! That said, there is a loose structure that connects the residency together: breakfast and free time in the early morning; group activation/dialogue/roundtable/movement workshop for 2.5-3 hrs in mid-morning; lunch at mid-day; solo creative studio time for 3-4 hrs in the afternoon; group dinner in early evening; campfire, social time and creative practice in late evening. At the end of each field school there will be an opportunity for an ‘exhibition’ or sharing of works made during the residency, plus a more formal closing dinner. How much reading and dialogue will take place? There will only be one ‘required’ reading for each field school, a text co-generated by all of the camp participants concerning the event theme. We ask that everyone read this text in advance in order to ‘saturate’ oneself for the dialogues that will take place each morning during the residency. In addition to this, we will provide a brief curated ‘micro-library’ of other texts relevant to each residency theme, which you may browse before, during and/or after the event as time and interest permit. What is the significance of the themes to each one-week field school? The themes of each field school have been created to foster thinking about the current ecological and social crises we are facing. The themes are an essential part of the pedagogical and artistic gathering of people at MLS and should be considered when developing a proposal for the specific residency in which you wish to participate. We are seeking uniquely talented indviduals with a passion for creative inquiry and a clear interest in a particular field school theme. Your academic credentials matter very little to our evaluation, and your transcripts do not matter at all. First and foremost, we are interested in interesting people and interesting project proposals, so spend time considering the links between you, your project idea, and the theme of the field school — even if you aren’t exactly certain what you will do yet. Applications will be evaluated blindly by the MLS Curatorial Collective members and vetted by independent external evaluators. The number of applicants admitted to each field school is dependent on the capacity of the space, with an upper limit of 25 people during each residency. As with any traditional school or residency application, the admissions competition varies according to the number of applications received in any given year. However, the primary consideration for each application received is to ensure an appropriate ‘fit’ between the proposed project and field school theme. Instead of ‘competing’, you are asked to ‘complement’ the thematic program. Are applications encouraged from non-artists? Absolutely! The MLS programme is intended to appeal to a wide range of creative individuals with an interest in the aesthetics of materiality, philosophical inquiry, movement exploration, scientific research-creation, outdoor community, etc. Are applications open to artist collaborations? Artist collaborations of no more than 2-3 individuals are welcome to apply to an MLS field school. Each person must fill out the application form independently, however. When it comes to the creative project proposal section, please copy and paste the same proposal in each individual’s application form, while indicating you are part of a collaboration. Will you provide a personal letter for individual funding purposes (university grants, arts council support, etc.)? Yes. We are happy to provide a supporting letter for your own funding purposes. Will you provide a receipt for payments made? Yes. We will provide every field school participant with a receipt for their full tuition amount. If you require a receipt for each payment for your own funding purposes, we are happy do so upon special request. When will I hear back on whether my application is accepted? Applicants for the 2018 residencies in Gaspé, QC and Saskatoon, SK will receive acceptance notifications by email no later than Feb. 15, 2018. How much time and space will participants have to work on their creative projects? Participants of each MLS field school will have full afternoon blocks of time dedicated to creative ‘studio’ practice or other inquiry. The amount and quality of working space will be dependent on each artist’s proposed project, the specific affordances offered in each of our residency locales, as well as a mindful concern for the fragilities of local ecology. Does an artist need to complete the creative project during the one-week residency? No! While attendance at an MLS field school may someday generate work for finished exhibition or publication, this should not be the emphasis of the creative project. In fact, we are far more interested in a work’s openings, its thought-in-progress, and its messy energy rather than more ‘completed’ projects. On the final (Friday) afternoon of the residency we will have the opportunity for a session of sharing these works-in-progress made during the week. How much is the field school tuition fee? Tuition for each of the four field schools in the 2017-18 programme is $695. Both Wander Lines and Reanimation and Unsettling have modest surcharges in support of additional programming opportunities. When are field school tuition fees due? 50% of the field school fee ($349.50, non-refundable) will be due by March 15, 2018 in order to confirm your acceptance and participation in the programme. The remaining 50% will be due 4 weeks before the first day of the residency being attended. Refunds for this second payment will be available up until 72 hours before the event meeting time. Are meals provided and included in the field school tuition fee? All meals are provided and included as part of the field school registration fee. Participants will be responsible for making their own breakfast and lunch from the food provisions available, while a full hot supper will be cooked and provided each day by the MLS curatorial team. If notified well in advance, we are able to accommodate most special dietary requirements. Is there funding available for successful applicants to MLS? Unfortunately we are unable to offer funding at this time for applicants to MLS. However, we are able to provide personalized letters of acceptance upon request so that individual participants may apply for external sources of funding (arts council grants, university conference travel, etc.). Is transportation included in tuition fees? No. All participants are responsible for getting themselves to and from a specified meet-up point in the area of the field school, from which we will travel together to the final location. What type of camping gear do I need to bring with me? 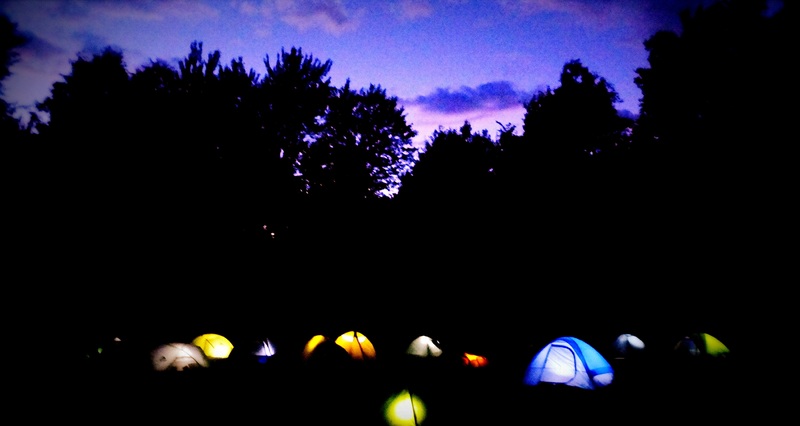 Participants for each one-week field school should bring personal camping gear. Personal camping gear includes: Tent, sleeping pad, sleeping bag, flashlight, personal dinnerware (mug, bowl, plate, and cutlery) plus anything else you think you will need for camping. A more complete gear list will be sent to those accepted to the programme. Should I bring any material with me besides camping gear? You should bring materials that complement your creative practice, but please keep in mind that your residency practice should strive to engage affordances in the local space and thematic context. You are responsible for the transportation of any personal materials to and from the site. You are also responsible for the safekeeping of all personal equipment and materials on site. This is an outdoor field school; often there will be no dependable source of electricity, no storage facilities available, and no secure space to leave equipment. Please bring materials that inspire you, but take account of the residency context. If you bring it, you may break it. MLS is not responsible for any personal materials or equipment brought to a field school site. Are the field school locations accessible? Due to the remote locations and variable geographies of our field school locations, we cannot guarantee accessibility in all cases. However, if you are an experienced camper with mobility-related questions or concerns please contact us for specific inquiries. If you have a specific question not answered above, please contact us here.